Straight from Child's 1897 catalog featuring nasturtiums in psychedelic patterns of gold, red, mahogany and more, this renewal of long lost Victorian age nasturtiums is fabulous! Easy to grow, it prefers the cooler temperatures of late summer to show off it's best finery. Starting Indoors: Sow in pots 2-4 weeks before last frost and cover by about 1/2”; secure containers with plastic to retain moisture while seeds germinate. Keep at 65°F. Thin about 1-2 weeks after germination. Starting Outdoors: Recommended. Direct sow after last frost. About 1-2 weeks after all danger of frost has passed, taking special care not to disturb roots. Nasturtiums perform nicely as an addition to any cottage garden and ‘Orchid Flame’ is good in containers too, as it has a trailing habit. Space about 8-12" apart in-ground; provide a trellis or other form of support for scrambling up with a few ties to guide, or use as a ground cover, in which case they can be spaced a little further apart—up to 2'. Watering Details: About 1” per week is plenty—keep watered during dry spells. Fertilizer: Do not fertilize, as this will limit blooms and stimulate excess foliage growth. Diseases & Pests: Aphids may pose a problem—treat with an insecticidal soap or neem oil if hosing down daily does not first resolve the issue. Plant: Solid green rounded leaves on somewhat trailing vines, though this cultivar has a bit more of a mounding habit. Flowering: Buttery yellow flowers with splashes of red, up to 2” wide. Seeds: Flowers turn into tri-lobed fruits, with each section containing one seed. 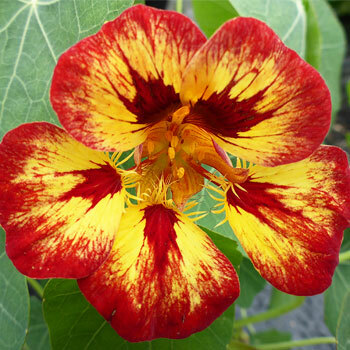 Nasturtium leaves and flowers are edible and make great additions to soups and salads. In the garden, they attract beneficial insects and can be used in vegetable gardening to trap aphids and deter whiteflies, protecting crops such as tomatoes, cucurbits, and brassicas.